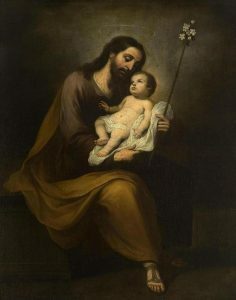 Monday, March 20 is the Solemnity of St. Joseph, since the traditional date of March 19 falls on the Third Sunday of Lent. Today, Wednesday, March 15 or Thursday, March 16 or Saturday, March 18, we will honor his place on the Carmelite calendar with a day of fast and abstinence. Friday, March 17 would not be acceptable as it is the Solemnity of Saint Patrick, the patron saint for our diocese. We also honor St. Joseph in a special way by his example as a righteous man, being the foster father of our Lord. He has a special place for us, as St. Teresa was very close to him in prayer. 31 – a) In the Teresian Carmel love of Mary, Mother and Queen, is united with love of her spouse Saint Joseph. The Father also gave him, “a just man” (Mt 1:19), guardianship of his Son Jesus Christ in the mystery of the Incarnation.